An ecosystem, as the term is used in Maine, is a group of communities and their environment that occur together over a particular portion of the landscape and share some common physical or biotic feature. Ecosystem types for Maine, with the natural communities that occur in each type are listed and described below. The natural communities listed for each ecosystem will not all occur in one particular location of the ecosystem; rather, each ecosystem will be made up of some assortment of the communities listed. Click on any column header to sort this table. Click on the Ecosystem Types to go to a fact page about each type. Information on the Ecosystem Groups is below the table. The forested ecosystems are defined by macroclimate and the dominant type of trees. Maine's diversity of forest types stems from its position in the transition zone between the Eastern Deciduous Forest to our south and the Boreal Forest to our north. 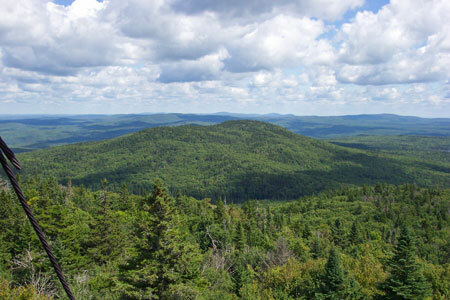 With at least 90% of its land tree-covered, Maine's history and economy are largely based on its forests. Upland areas where tree cover is sparse or absent. Most communities in these ecosystems are terrestrial, but the ecosystems may include small pockets of palustrine communities. Peatland ecosystems in closed or open basins, where conditions allow accumulation of a well-developed layer of shpagnum and/or sedge peat (most commonly the former). 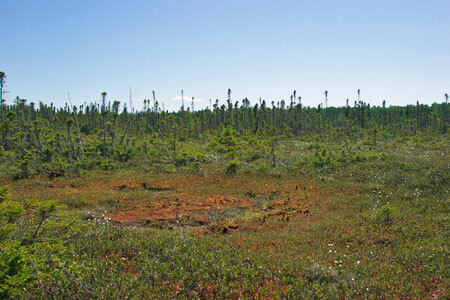 Different researchers have classified Maine peatlands in different ways: by basin morphology, by vegetation, by hydrology, or by a combination of those factors. No classification is "right" or "wrong"; their utility depends on their purpose. A classification developed to evaluate peatlands for mining potential would clearly use different criteria than one used to evaluate peatland biota or to elucidate developmental processes in peatlands. The classification used here is derived from Davis and Anderson's work, which includes both morphological and vegetational criteria. This approach recognizes that peatland conservation should address both whole systems and individual collections of species. Thus, while a kettlehole bog and a domed bog may have nearly identical species complements, they are very different landscape units. Likewise, patterned fens and unpatterned fens are floristically almost identical, but the patterning is an interesting morphological character that separates that ecosystem type. Peatland complexes containing more than one of the above ecosystems also exist. These are treated in this classification as a collection of ecosystem units. 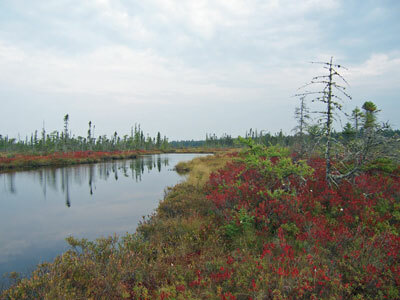 The nearshore and shoreline portions of lakes, ponds, streams, and rivers, excluding areas where peat development is sufficient (generally more than about 1 meter deep) to classify as peatlands. These ecosystems include areas where vascular plants are the primary producer, but do not include open-water ecosystems. Additional work beyond the scope of this classification needs to be done to classify open-water communities in a way useful to biodiversity conservation (Gawler et al. 1996, Vaux 2001). All areas immediately associated with or affected by tidal waters, i.e., estuaries and coastal shores. Davis, R.B. and D.S. Anderson. 1991. The Eccentric Bogs of Maine: a Rare Wetland Type in the United States. Maine Agricicultural Experiment Station Technical Bulletin #146. University of Maine, Orono. 144 pp. Davis, R.B. and D.S. Anderson. 1999. A Numerical Method and Supporting Database for Evaluation of Maine Peatlands as Candidate Natural Areas. Maine Agricicultural Experiment Station Technical Bulletin #175. University of Maine, Orono. 166 pp. Davis, R.B. and D.S. Anderson. 2001. Classification and distribution of freshwater peatlands in maine. Northeastern Naturalist 8:1-50. Gawler, S.C., J.J. Albright, P.D. Vickery, and F.C. Smith. 1996. Biolgoical Diversity in Maine: an Assessment of Status and Trends in the Terrestrial and Freshwater Landscape. Maine Natural Areas Program, 93 State House Station, Augusta, Maine. 79pp. + appendices. Vaux, P. 2001. Maine Aquatics: Maine Aquatic Biodiversity Project Newsletter. MABP, Room 215, 650 State Street, Bangor, Maine. 5pp.